The WAWSA SCADA System provides remote monitoring and control of the entire Western Area Water Supply Project. The project consists of two Water Treatment Plants (WTPs) and over 30 remote water storage reservoirs, pumping stations, and truck fill depots located throughout ten counties in western North Dakota. The automation systems at the WTPs and remote sites were all designed, programmed, and commissioned by AE2S. AE2S is called on regularly for support and service for this system. Each site is controlled by an Allen-Bradley Programmable Logic Controller (PLC) and utilizes some type of data connection to communicate back to one or both of the WTPs. The communications system is a hybrid of licensed and license-free UHF radios, microwave radios, internet service, and cellular service. A master PLC at the WTPs polls the remote sites for status information on regular intervals and writes setpoint changes made by operators. If a remote site has an alarm or a setpoint change, the remote PLC writes that information immediately to the master PLC. 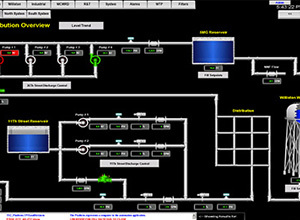 The master PLC is connected to a Wonderware System Platform SCADA system which controls the graphics, alarming, and data logging. The Wonderware application was developed completely by AE2S programmers. WAWSA operators and managers can access the SCADA system remotely with a PC or mobile device over a secure VPN connection. AE2S also developed a customized SQL Server and web based reporting application to handle the unique needs of the project.